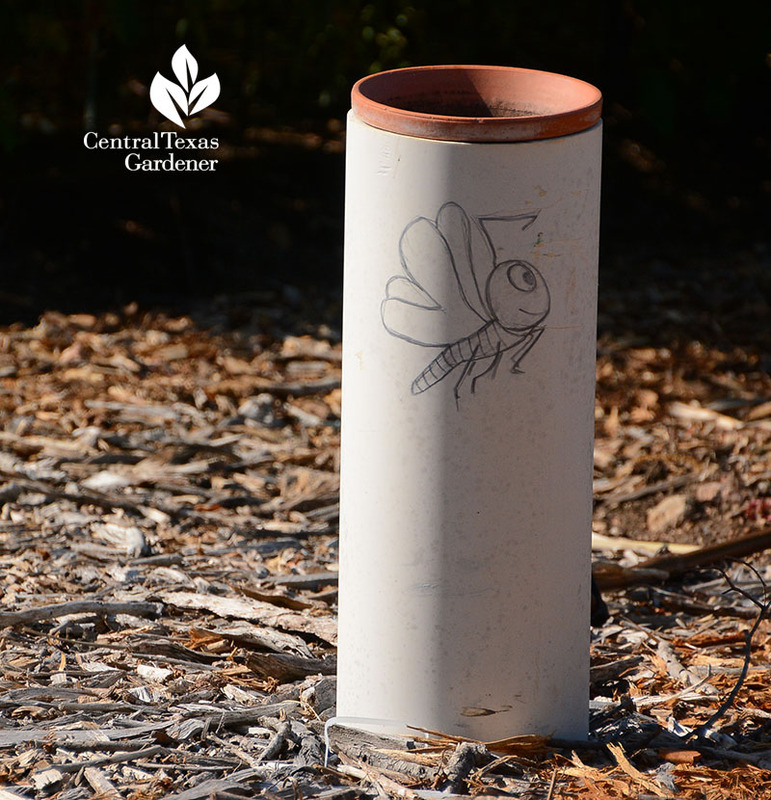 KLRU’s freelancer Katie Nelson’s a “yard stick” to this very young Blanco crabapple at Zilker Botanical Garden! 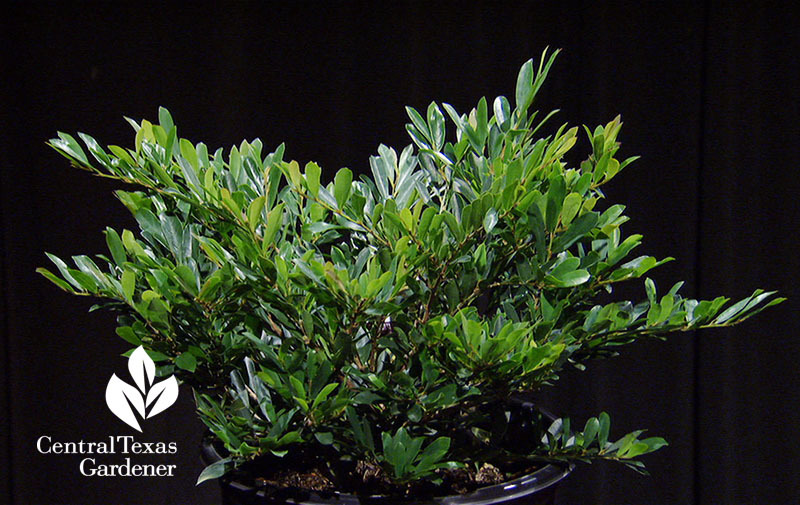 In a few years, this small-sized native tree will top her, but thrive companionably under historic live oaks. 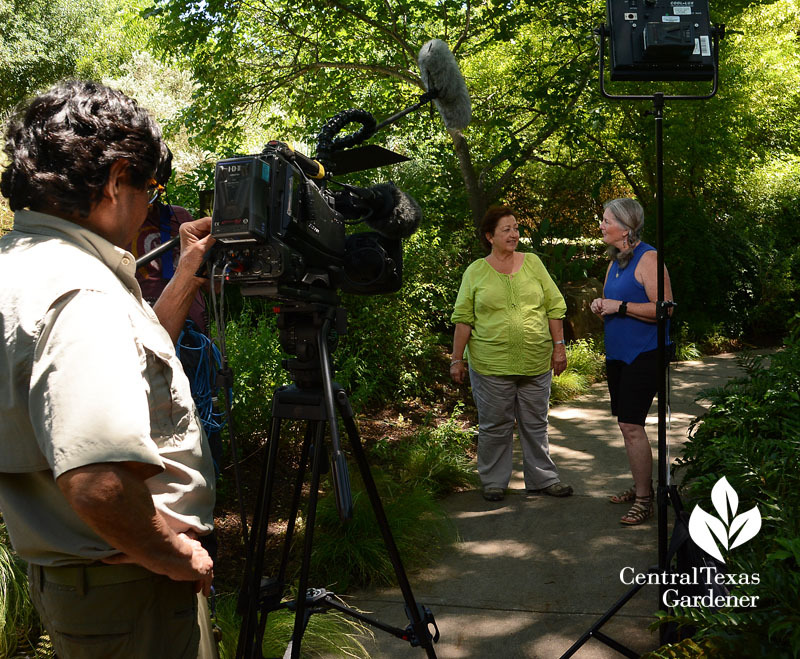 Last week, she joined director Ed Fuentes and me to tape the recently completed Riparian Streambed adjoining the Taniguchi Japanese Garden and the Rose Garden pond. 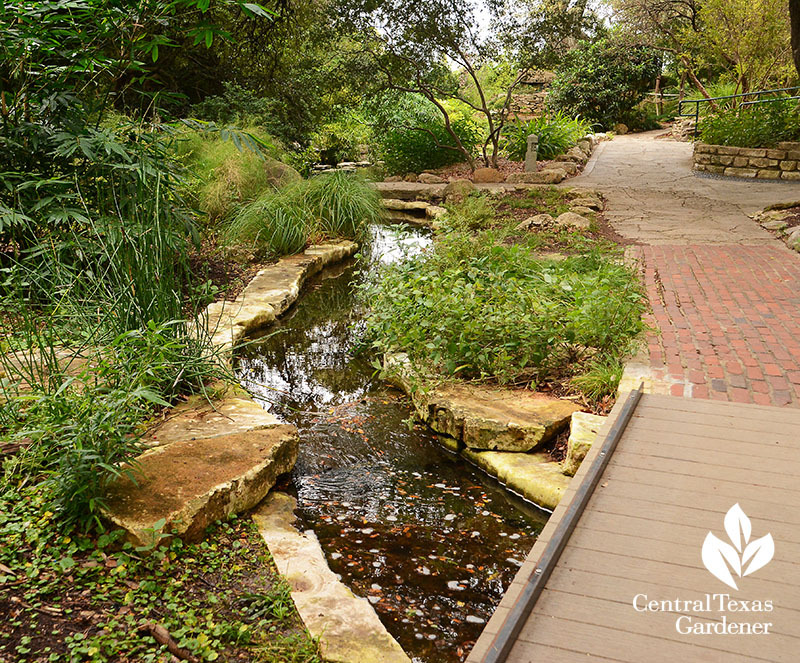 Designed and built by David Mahler’s Environmental Survey Consulting, native plants—including pond and stream bed borders—illustrate sustainable ideas for shade and woodland edge sun. 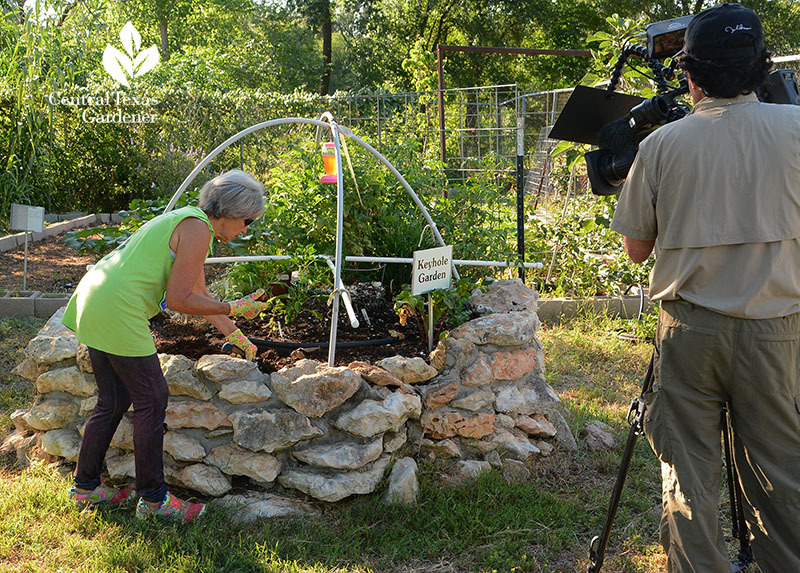 Watch for our story in January! 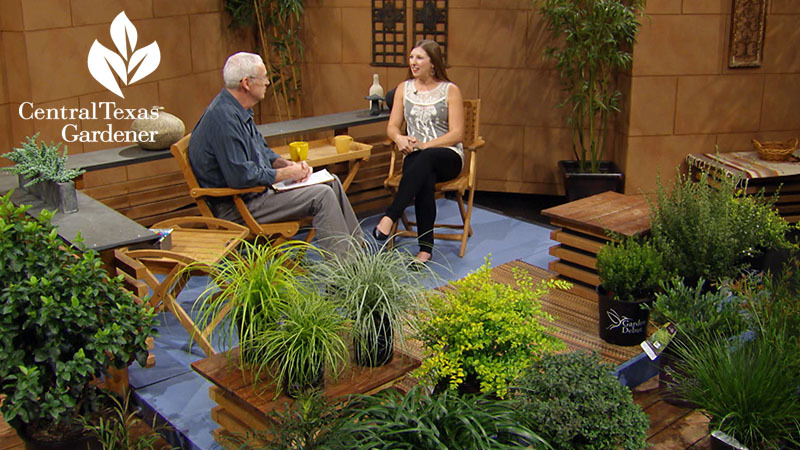 This week, Daphne answers viewer questions about their native trees. 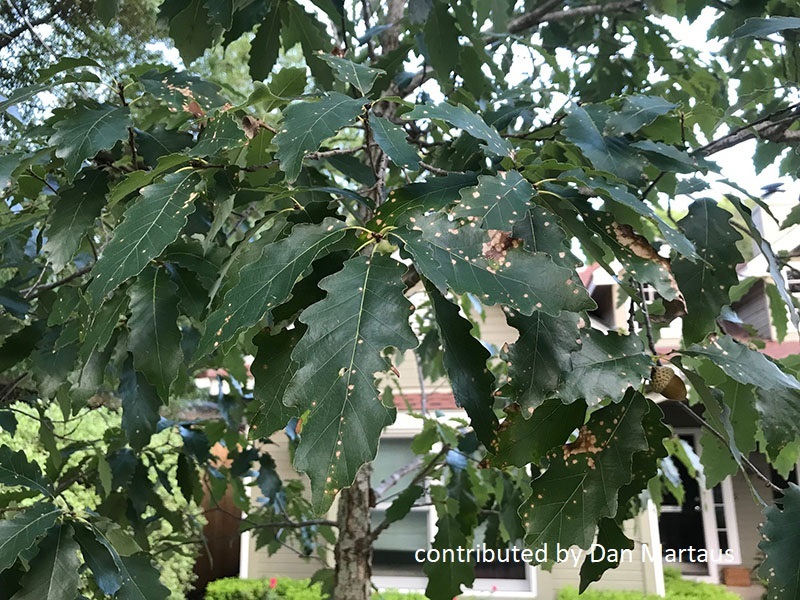 Dan Martaus has a young chinkapin oak with peeling bark and white spots on leaves, two things he’s never seen before on his tree. 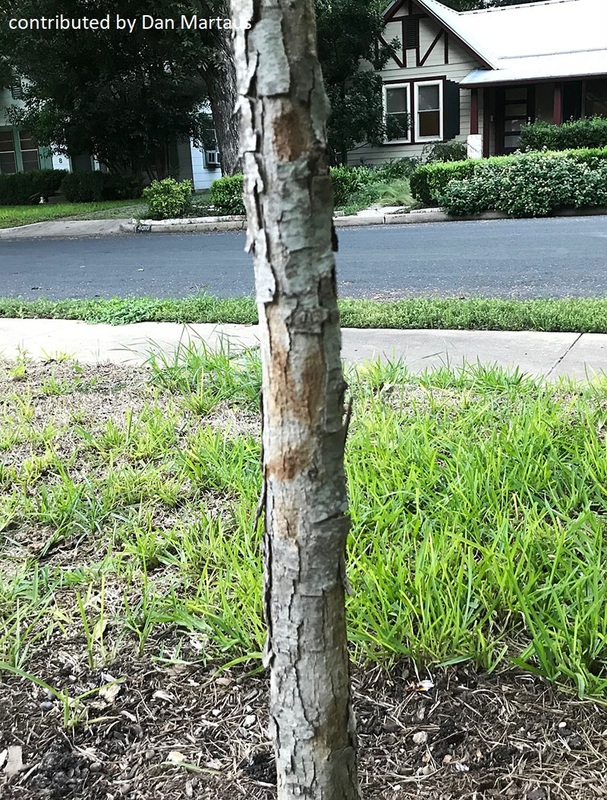 We consulted certified arborist April Rose, City of Austin Urban Forest Health Coordinator, who tells us that the peeling bark and color change are natural as chinkapin oaks (and Monterrey oaks) mature. 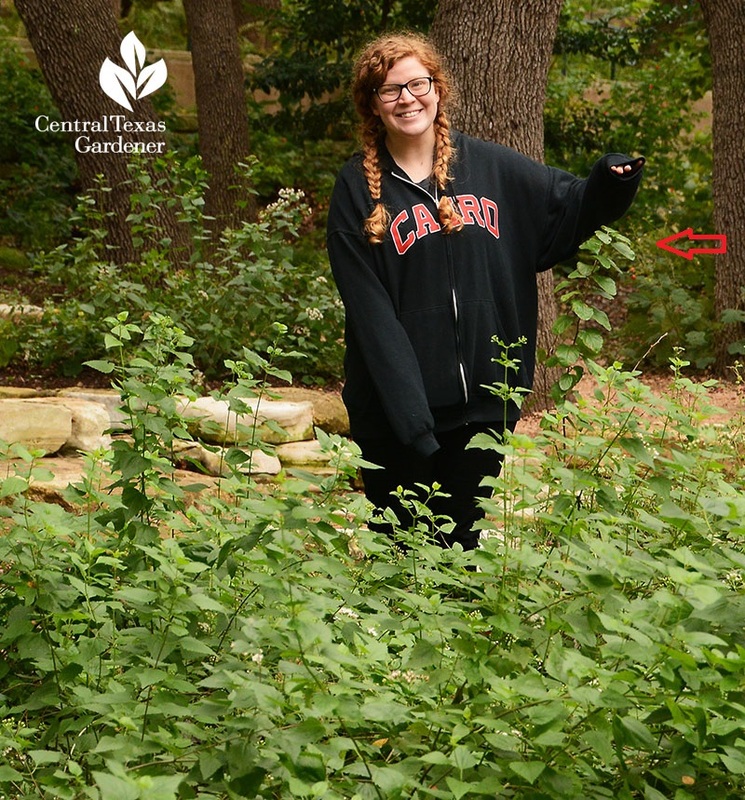 The white spots are common leaf fungi that occur during high humidity and abundant rainfall like we experienced in late summer and fall 2018. Nothing to worry about. April notes that Dan’s done a good job with this tree: the trunk flare looks good where the trunk meets the lateral roots. 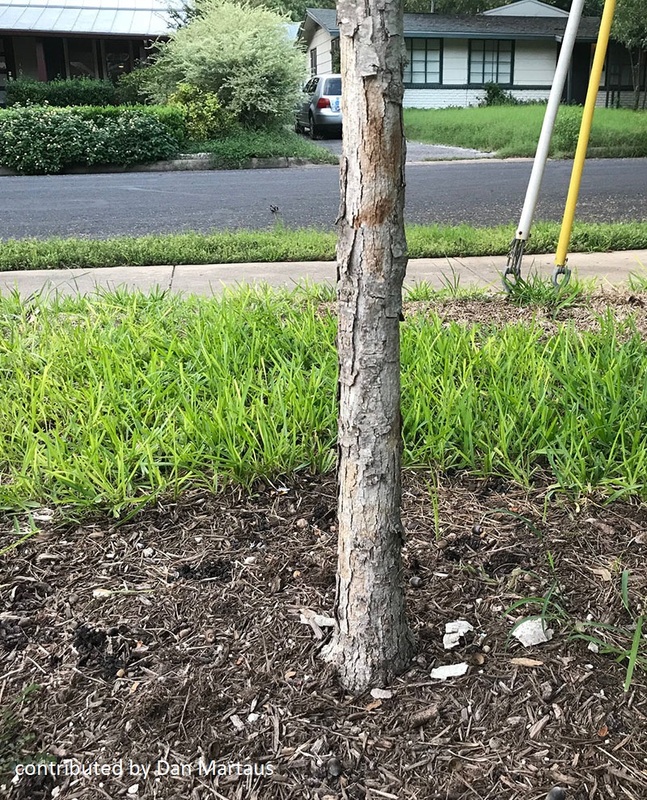 Since now’s a great time to plant trees, remember to keep that flare above ground and don’t pile mulch against the trunk. 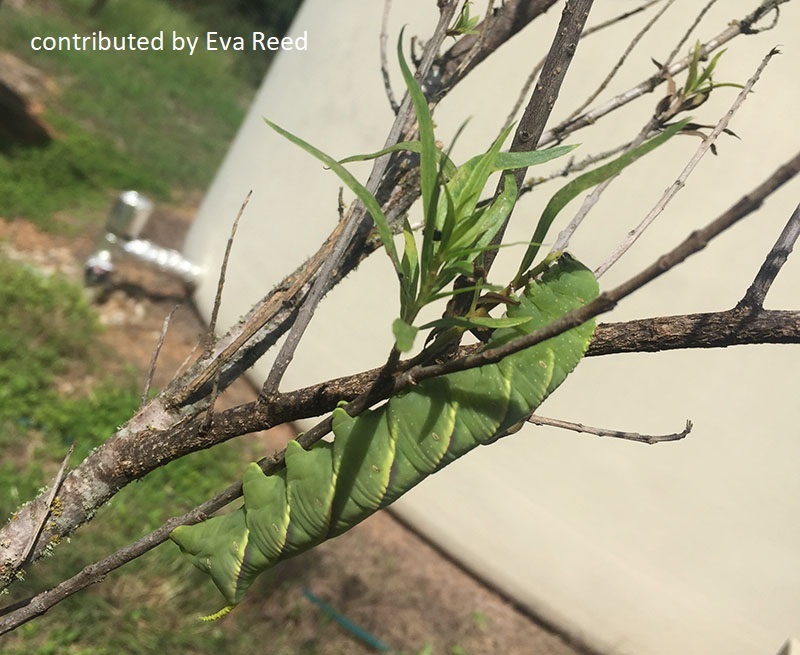 A first for CTG: Eva Reed found several plump, 4-inch caterpillars on her desert willow. 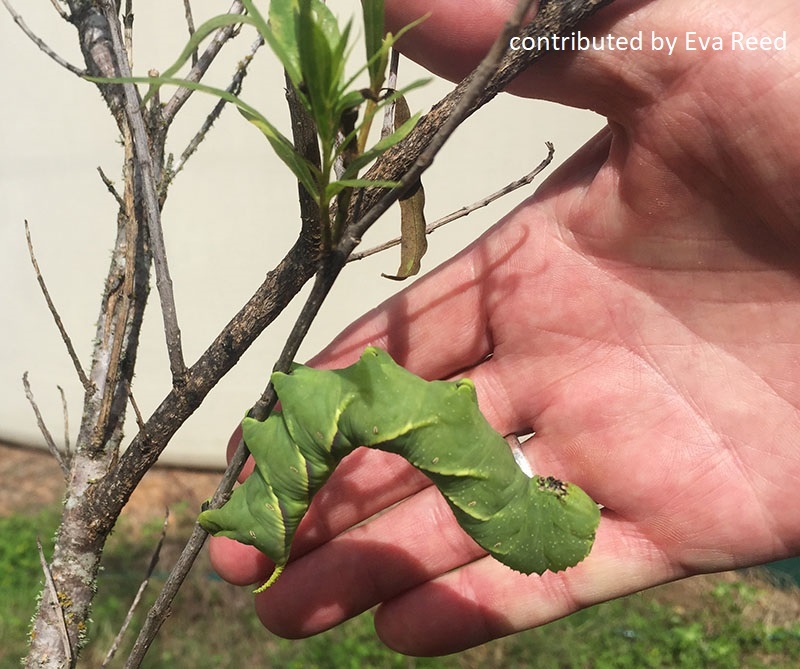 Daphne confirms that they’re rustic sphinx moth caterpillars, akin to tomato hornworms. Since the leaves will fall soon, no reason to do anything about them. Eva let them carry on their merry way after taking their picture. Perhaps she’ll get pollinating moths out of the deal! Get Daphne’s complete answers and more great viewer pictures. 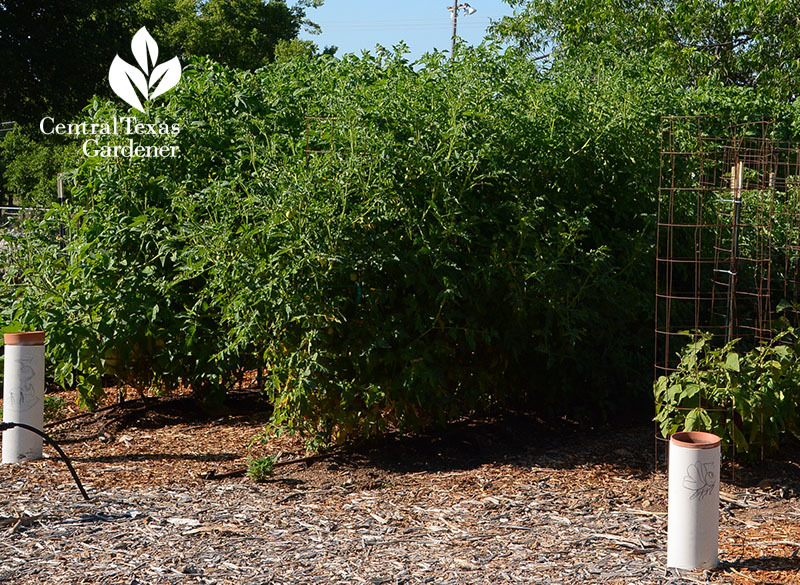 Next, since so many of us have shade, Jessica Robertson from wholesale Greenleaf Nursery Company texturizes with easy care plants for sun, deep shade, and in-between. 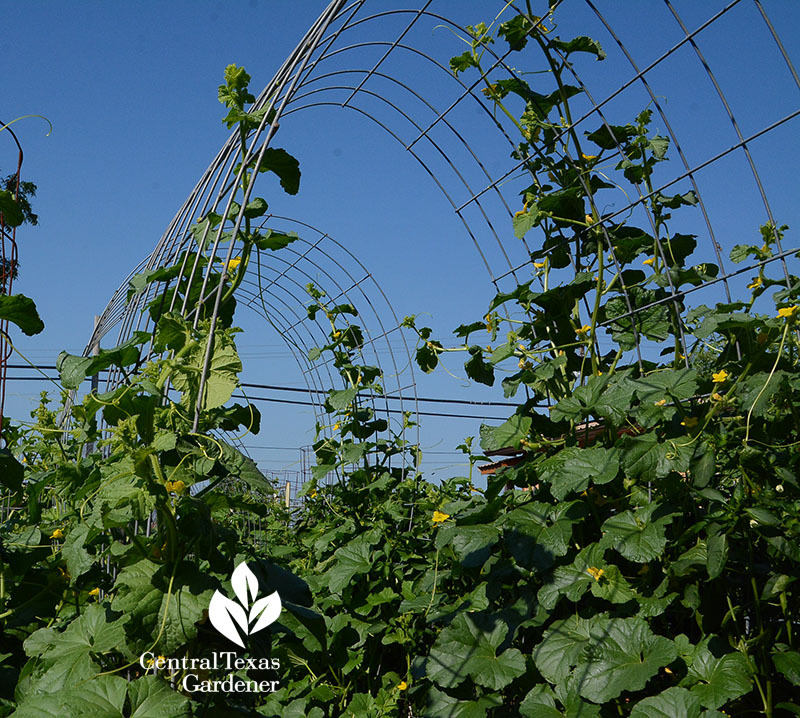 Although most of these plants aren’t native, they’re extremely hardy specimens for structure, screening, and groundcover. For sun, ‘Woodlanders Hardy’ bottlebrush is cold hardy to 0°, resists deer, attracts bees to its warm weather frothy flowers, and grows to a compact 6×6’. Wow! 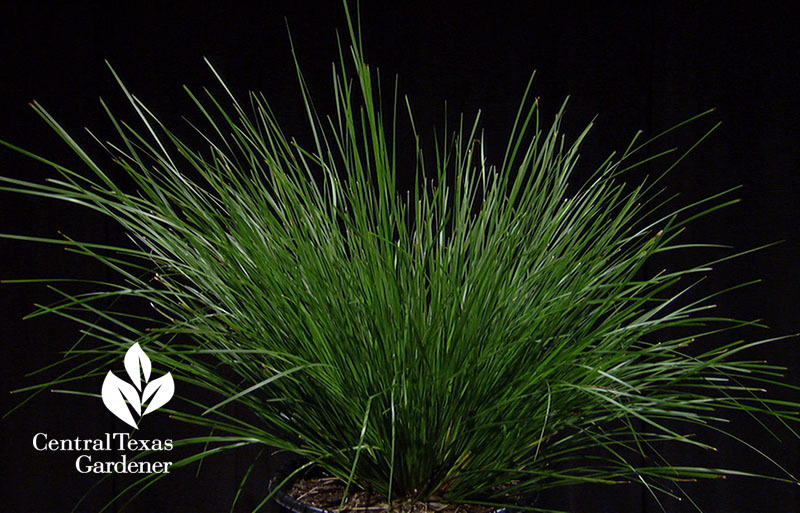 For sun to heavy shade, what about deer resistant, drought tolerant ‘Breeze’ Lomandra? Supposedly hardy in Zone 7b to 11, it can brown on top in cold weather but bounds back from the roots. I love this texture and I admit, I raced out to get one of my own. 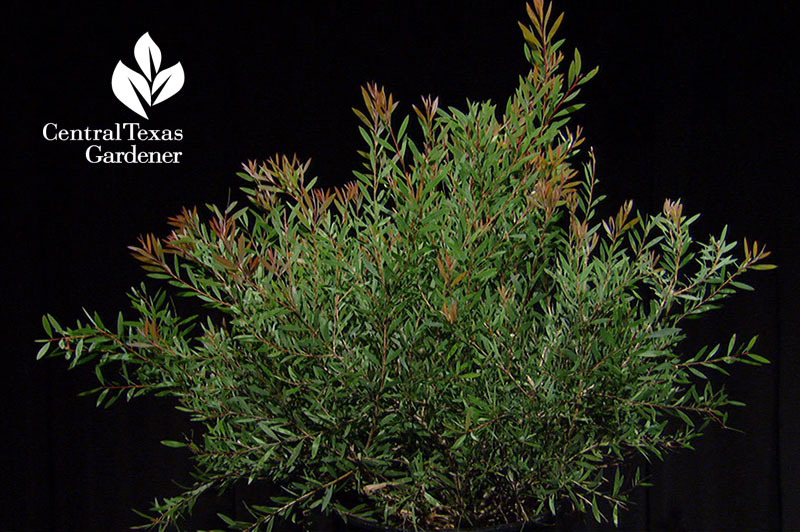 Another small evergreen she brought along is ‘Cinnamon Girl’ distylium that grows to about 2’ wide and 4’ tall in sun. Two years ago, a nursery sent me this one to trial just when it hit 95° and no rain for months. Not only did it last through summer, it made it through cold, including last winter’s several days of below 30°. Mine gets early morning sun. Keeper! Jessica’s got lots more ideas, so watch now! 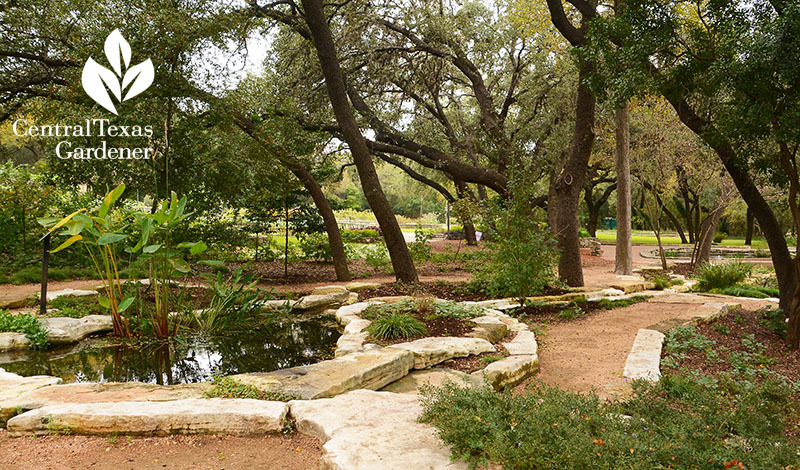 See how native and adapted plants align as Trisha Shirey and Tennessee gardener Barbara Wise swap shady tales at Lake Austin Spa. 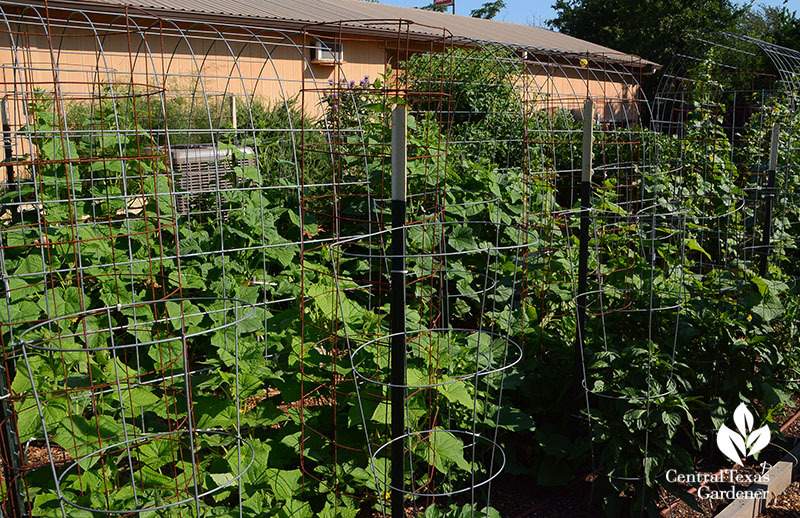 Sun’s ideal for many plants, but not always the best for garden pictures. 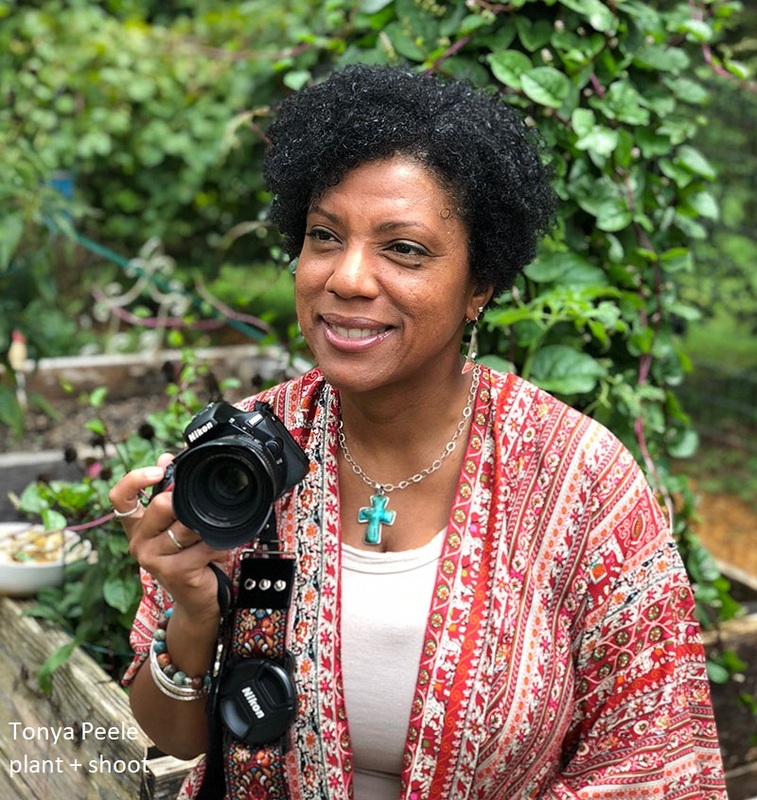 North Carolina gardener and photographer Tonya Peele’s got your Plant + Shoot tip: grabbing the camera at the “golden hour,” just before sunrise or just after sunset. Watch now! 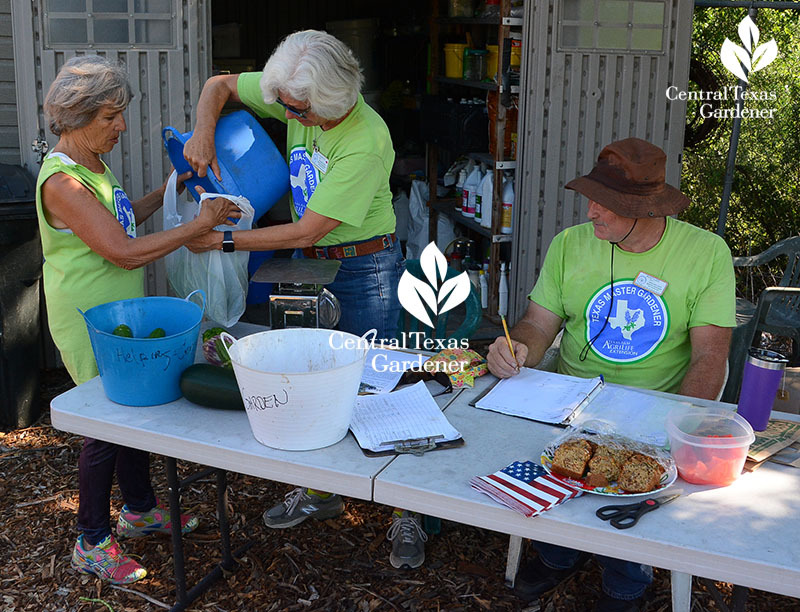 On tour: This week before Thanksgiving, we celebrate the Highland Lakes Master Gardeners who turned rocky soil into bountiful harvests for neighbors in need at the Helping Center Garden in Marble Falls. 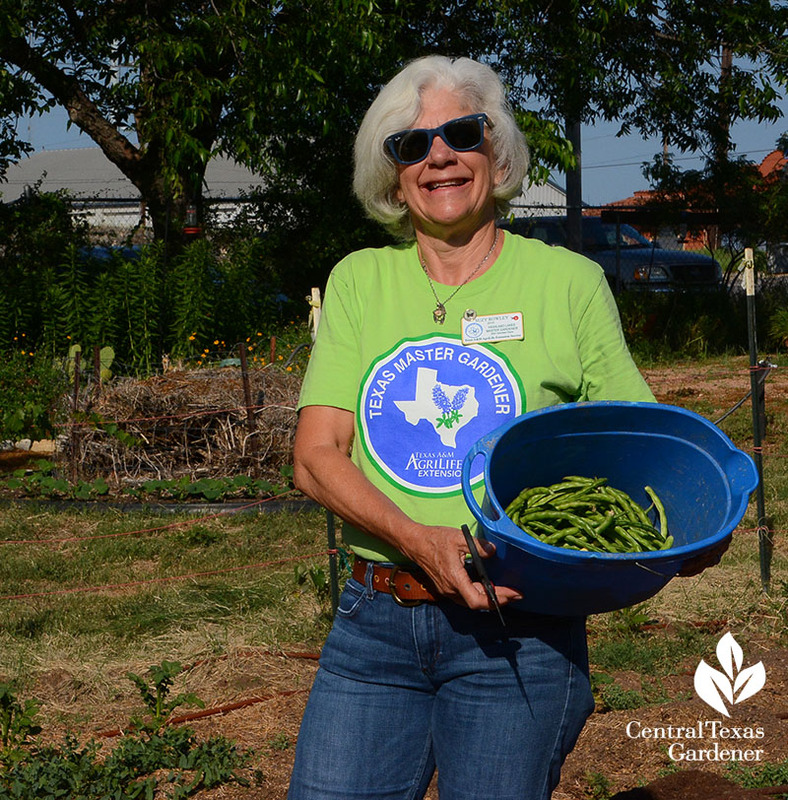 In 2011, they gradually took over weed-infested, hopeless soil on a little bit of land next to the Helping Center Food Bank. 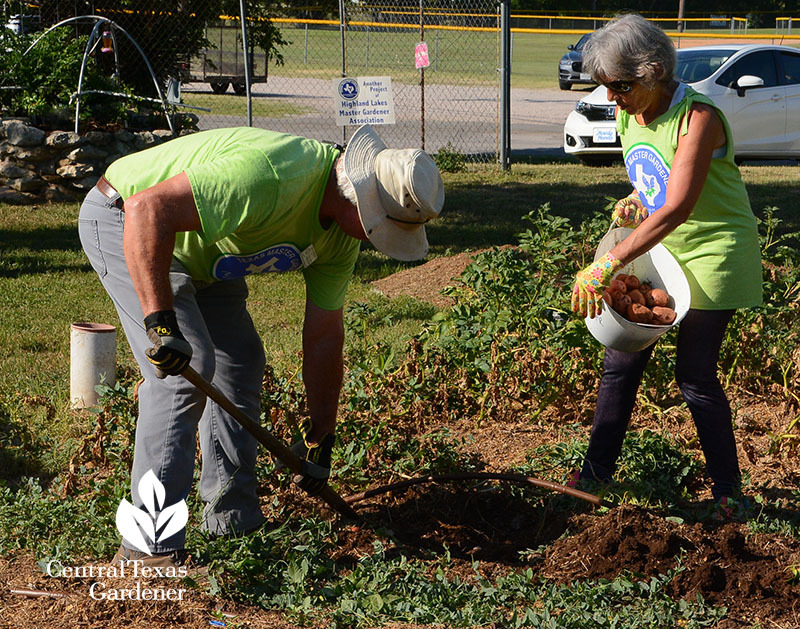 Thanks to diligent hard work, now they’re donating 3000 pounds of organic fruits and vegetables each year. 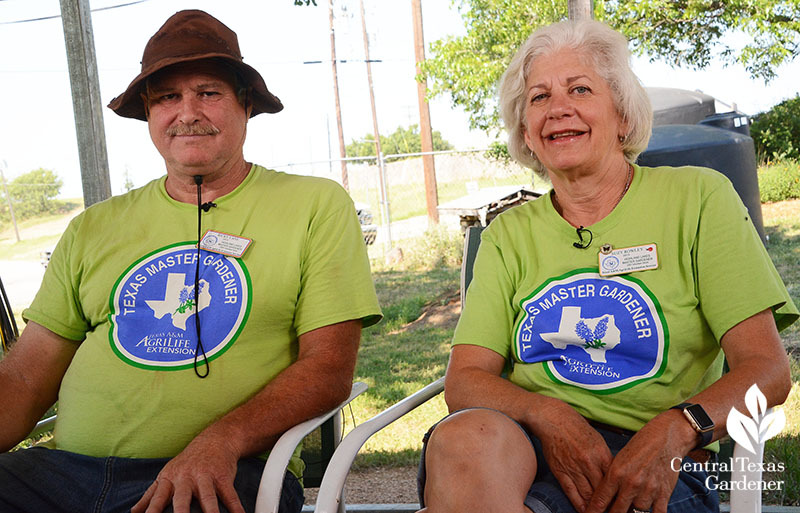 Ricky Lane and Suzy Rowley explain how they started: digging out literally tons of boulders. 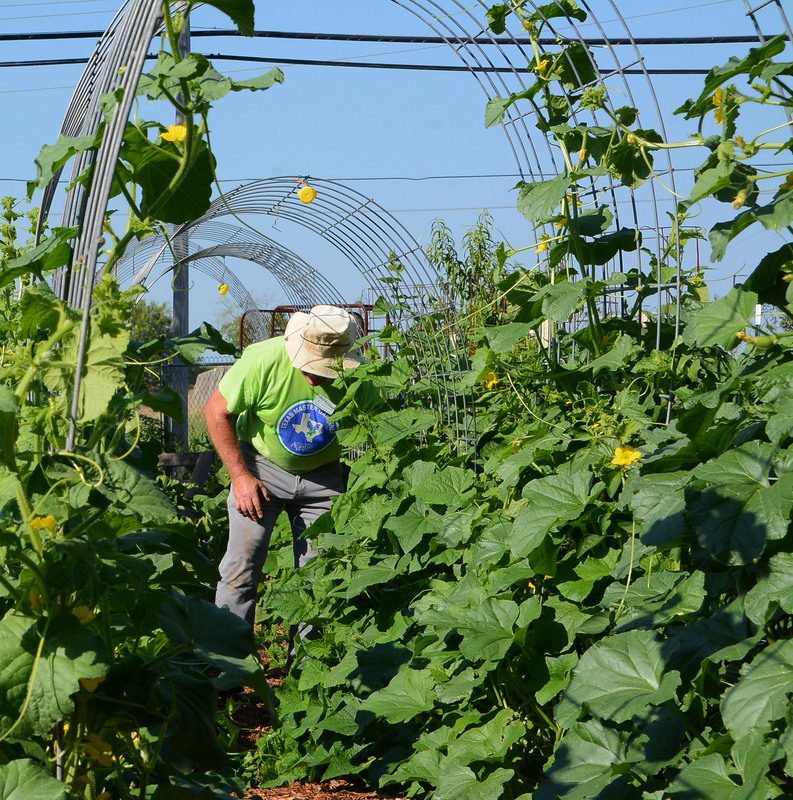 Ricky handles every day-to-day task under the Texas sun. 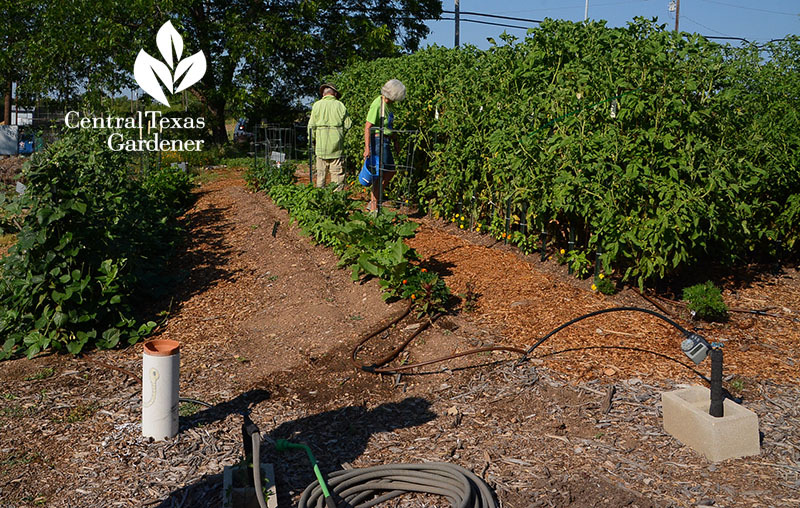 He set up and maintains the drip irrigation systems fed by rainwater collection, trains community volunteers and students, and builds structures. 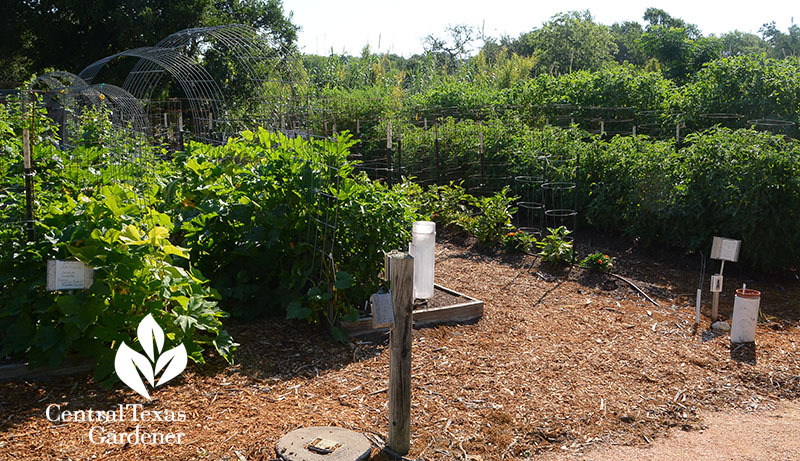 He wrangles ingredients for the compost bins to turn heavy soil into potato-perfect ground. 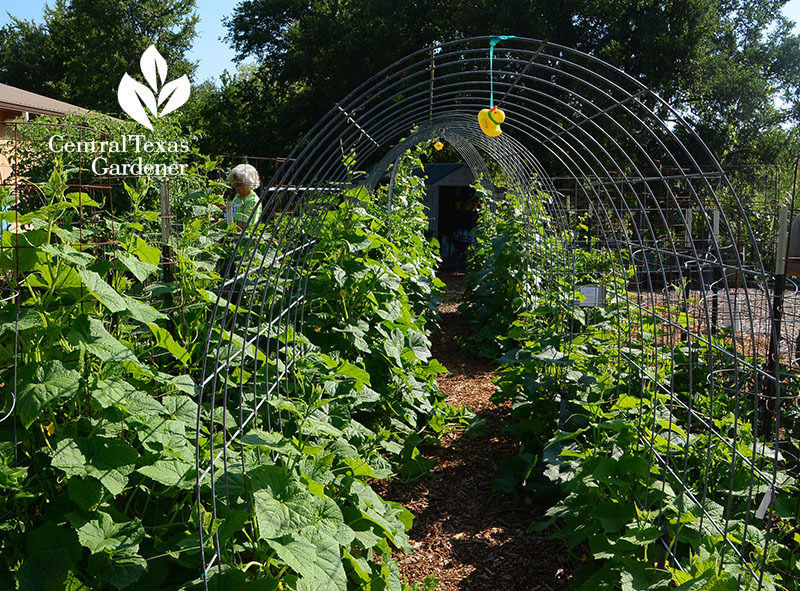 As Master Gardeners, they educate the public about growing techniques, including raised beds, keyhole gardens, and structures to support vining crops. Plans are in the works to move to larger quarters with better mobility access. 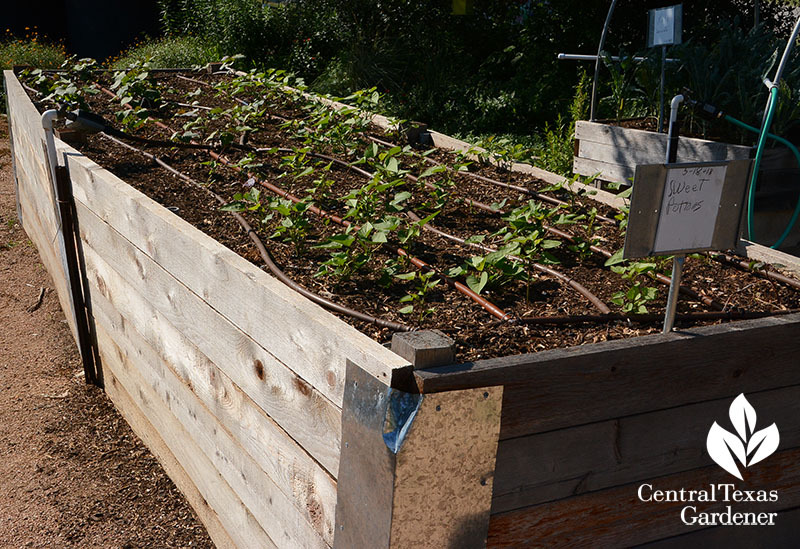 For now, they built a tall raised bed for the mobility challenged. 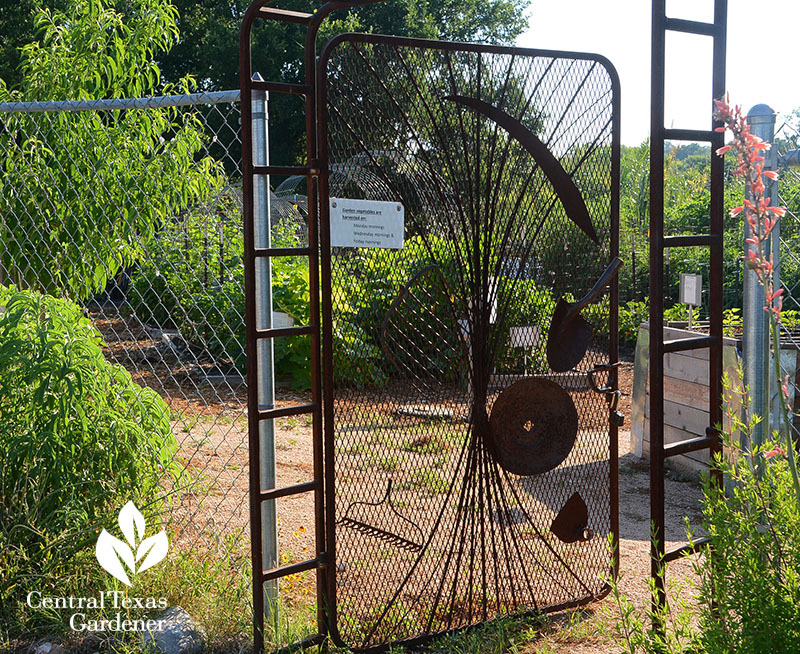 Although the Helping Center Garden is a project of the Highland Lakes Master Gardeners, the budgets are separate. 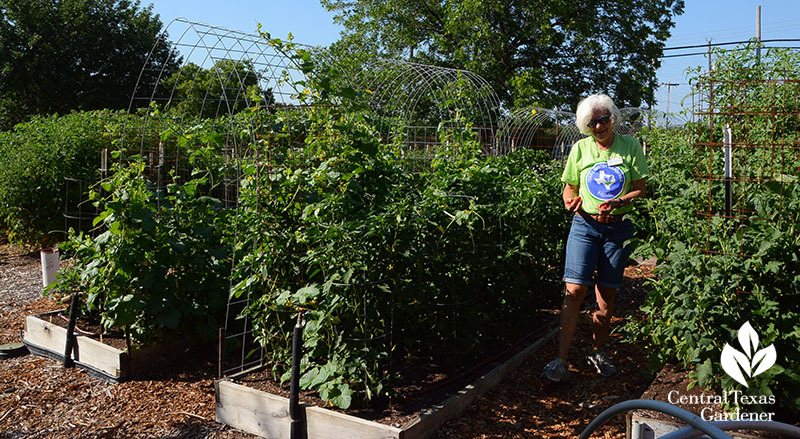 Seed companies, nurseries, and organic fertilizer suppliers donate. And they hold fund-raisers and events to support the supplies they buy.